The process of tube welding requires several variables to be in check for efficient and stable production and to meet the quality demands of the industry. Mill dynamics, from setup to production, have an impact on the stability of these variables. Measuring and monitoring these variables is the first step in controlling them and improving weld quality for tube fabricators. In response, tube fabricators employ laser based weld inspection systems to monitor a variety of geometrical features around the weld area of the tube and to provide early warning of quality issues related to the welding and forming process. Traditionally placed right after the weld box on a tube mill, where the majority of tube forming and weld bead measurements can be made, such systems provide the operator with an early warning of weld related process variations that could lead to quality defects. While most tube mill customers use the system right after the weld box where the most as-weld related information is available, some fabricators use it after scarfing to check for quality issues related to the scarfing process: does the scarfing tool cut too deeply, or not enough? Is the tool damaged? Is the scarf cut a consistent amount? All these questions can be addressed by installing a weld system after scarfing. 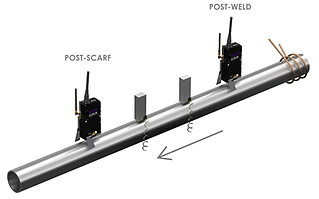 Now, Xiris has developed a double head laser based weld inspection system that allows for one head to be placed immediately after the weld box and one head immediately after scarfing. In this way, tube fabricators can monitor their tube production before scarfing for weld related defects; and after scarfing for potential scarf related issues. With a double head configuration, tube fabricators can better control their process and improve quality by monitoring the tube profile, weld bead geometry and final scarf cut, all controlled from a single system.